Glenn grew up in Bellefonte, Pennsylvania, the county seat of Centre County, a few miles from Penn State University. This is Pennsylvania Dutch country, and he grew up around people with names like “Hugg” and “Treaster”. His eventual Mother-in-Law was Martha Zahniser, and he took great pride in joking that he was the only person he knew with an Aunt Ollie (Oh-lee) Winkelblech. 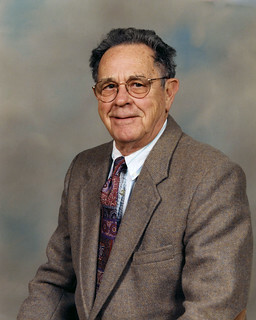 His parents, Edwards Peters and Blanche Treaster Peters (of Coburn) gave him an older brother James, an older sister Kathryn (known as “Kapey”, from her initials), and a “kid sister” Marguerite (Peg). When we visited in 2002, the family home was gone, but he showed me where it had been, on Thomas Street, a block from the railroad where his father worked. One way they economized through the Depression was by taking furniture the railroad had damaged in transit, and they never had two chairs which matched in the house. He claimed the clothesline was strung across the dinner table, and he never got to see his family on wash day. The front porch had a tin roof, which must have seemed a good idea until the horse chestnuts started to fall from the tree over it. Whatever racket it made, it never stopped his mother from hurrying through the dishes each night to get out there to sit and see who was on the street to gossip. Sometimes, she’d meet hobos who would come straight off the train to their house looking for a meal. She swore the house had to be marked somewhere, but was never able to find the mark. His father would stay in to read the local paper, and laugh and laugh at it. When he was old enough, Glenn read it himself, but could never find the joke. His mother would take him with her on the train to Altoona to do her shopping. They’d eat at the Walgreen’s lunch counter, and once the cook used the ladle to make a crater in the mashed potatoes to hold the gravy. She thought that was so clever, and started doing it at home. She’d serve Glenn’s plate that way, and they’d look at each other and smile. When Hoot Gibson and Ken Maynard were playing in cowboy pictures at the State Theater, Glenn would take Peg, and always let her bring her guns. When Frankenstein was the hottest ticket in town, his father took him to see it. There was such a crowd that they couldn’t get two seats together, and Glenn couldn’t find him on the sidewalk afterwards. Like Bill Cosby, Glenn had to run all the way home, flying over the Spring Creek bridge with monsters at his heels. Glenn’s best friend was Frank Gryctko. (Glenn noted in an email message, “Spelling of name is correct.”) Frank was the son of the owner of the Bush House hotel, and they spent hours playing Monopoly on the floor of one of the unoccupied rooms. They rode their bikes on the third floor, stayed over, had breakfast in the hotel’s dining room, then bought cones at the little store next door and filled them with ice cream from the hotel’s freezers. They made a pact that they would always take soda crackers when they went hiking up Half Moon Hill. At Christmas time, they’d set up the model railroad in the hotel lobby, running track under the furniture so the train came out between someone’s feet. In the summer, they’d ride horses on his Uncle Paul and Aunt Ollie’s farm. If Glenn was always as vocal and skeptical as he was in later years, I’m sure he was a handful at school. I do know that he and a friend would play hooky and go watch trials at the courthouse. The judge once stopped the proceedings to ask them what they were doing there, and they told him they were researching a paper for a class. The judge commended them, and they sat there all day, dutifully pretending to take notes. Glenn claimed to have always been picked last for sports, which “gives you a lot of trauma”. One Christmas, he and his friends decided to go caroling. A crowd came to the door of the first house they visited, and when they heard someone in the back say “Isn’t that awful?”, they gave it up and went home. He took a job at the five-and-dime, using the P.A. system to announce the specials to the customers standing a few feet from him. He started dating Elizabeth Anne (“Chickie”) Fisher (born 6/24/1922). On our 2002 trip, we got to visit one of the friends who was part of the gang that would ride with them to dances in State College. Through his father, the family got free railroad passes, and Glenn made trips to Washington, D.C. and to the New York World’s Fair. He and his brother made a trip to New Orleans, but their money and passes ran out when they got back to Gettysburg, and they slept in the stadium of the university where his brother would later be a student. During Glenn’s Senior year, a fire in the Chemistry lab burned down the high school, and he took his last classes at Bellefonte Academy. He attended Pennsylvania Business College in Harrisburg for a year before the U.S. entered the war. Glenn enlisted on the 24th of February, 1942, and went to train with the 10th Mountain Division — the “Ski Troops” — at Camp Hale, in Leadville, Colorado. 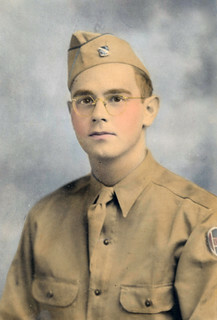 Both the camp and the division were brand new, and Glenn was one of the first American soldiers trained in techniques of fighting and surviving on mountains in anticipation of the battles in the Italian Alps. It was a vast and bustling camp. Glenn remembered walking through clouds on his way to breakfast. Glenn became sick during training, and was sent to the South to recuperate. I don’t know exactly what he had, but he said he spent a lot of time swimming to regain his strength. While he was in Myrtle Beach, Anne came down, and they were married on the 15th of July, 1943. He was also given an aptitude test, and the Army decided his business training would be put to better use as a clerk, and he was transferred to work under General Patton. He crossed to England on an ocean liner, sleeping in a drained swimming pool, and eventually worked in Riems, France. He told me he helped debrief soldiers who were being sent home, to see if they’d picked up any information which could be useful to Army Intelligence. Like most G.I.s, he funded his weekends in Paris with a carton of cigarettes. He was discharged as a Corporal from the 180th Field Artillery Battalion on the 6th of January, 1946. Glenn’s trip with Jim must have left an impression. 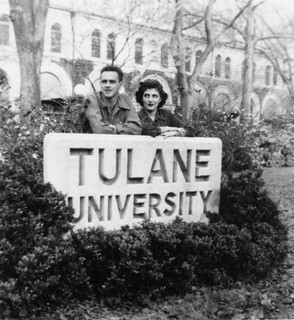 After the war, he and Anne moved into one of New Orleans’s shotgun houses, and Glenn finished his business studies at Tulane University. Anne went to work with one of her friends at Godchaux’s department store, and Glenn went to work for Lykes Brothers Steamship Company. He enjoyed the change of cultures, swimming on Christmas Day, going out with one of his officemates for a lunch of red beans and rice, and learning to take chicory in his coffee. When he had company from back home, he’d take them out to the Court of Two Sisters, to a restaurant where they dimmed the lights and raised a bottle of cognac to salute a statue of Napoleon on the mantelpiece when it was ordered, and to one of the gay bars, watching mischievously to see what his Centre County friends would make of all this. It wasn’t all an offbeat adventure, though. Summer was punishingly hot and plagued with bugs, and it was a long trip to see their families. It was also Glenn’s first experience of thorough-going racial segregation. He refused to move a “colored” sign to the back of his seat when he sat down on the bus, and never forgot seeing a black hand reach in a little window at the back of a bar, buying a bucket of beer to pull out to the alley where 30% of the population was relegated to drink. After a few years, they decided to head back North. They moved first to Washington, D.C. I don’t know what business brought Glenn there, but Anne went to work at “The Game Room” on Connecticut Avenue, selling furnishing for dens and billiard rooms and the like. Her brother Bill remembers coming to visit them and having no idea what to do in a big city. Glenn sat him down and showed him how to use the streetcar system, and told him what corner to stand on if he wanted to see the President. He went there and waited, and sure enough, that was where the motorcade came out of the White House. Before long, they moved to the North side of Baltimore, then started looking for a home in the suburbs. Glenn decided he wanted someplace on the North or South side of the city so he wouldn’t have the sun in his eyes going to or coming from work. They started renting a house in Ferndale, next to Friendship Airport (today’s BWI). It was around this time that they adopted their son Todd. 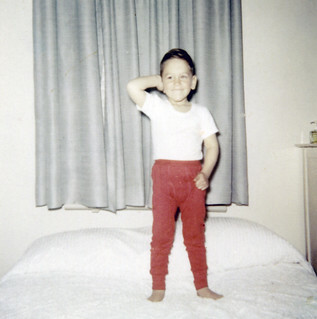 He was born on February 28th, 1955, and was about a year old when they met him. The people at the orphanage had been calling him “Jack”, so he became Todd Jack Peters. He’d become attached to the old woman who had been taking care of him, and cried for days after they brought him home, but soon learned it was his last stop, and that he had a loving family for the rest of his childhood. As he grew, they decided they wanted a larger home of their own, and bought their house in Glen Burnie. They were actually looking at another house by the same builder when he told them there was a new one almost completed around the corner which might fit them better. It was the first house on the street, and there was no street yet, so they walked over 2x4s to see it. Anne was sold on the large closets, and they took it. They paid $15,000 and moved in on April Fool’s Day, 1965. When the second house went up across the street, it was bought by the Yi family. They had come straight from Korea, knew no one, and spoke little or no English. Anne took them an apple pie, and they were friends for life. Glenn went to work at Ramsey, Scarlett, and Company. He knew of them from his time with Lykes Brothers, and when they told him they didn’t have any positions available, he came back the next day and asked again. He told them they were the best company, and he wasn’t going to work for anyone else. He became an export traffic manager there. Someone would call him with farm equipment headed for Italy or canned goods going to Brazil, and he’d find a ship for them, arrange for the trucks to be met at the dock, file the paperwork with both governments, etc. He gleamed all sorts of odd knowledge, like the fact that labels had to be shipped with cans going through the Panama Canal and applied on arrival, a trick someone learned after discovering the humidity made the labels fall off, and further discovering he had no record of what was in which cans. Glenn loved his work, spending his days on the phone with people all over the world, going to dinners on ships, and acting as unofficial travel guide for the London representative of a Saudi sheik. (After he retired, one of his coworkers told him everything had moved to computers, and all the fun had gone out of it.) His outgoing nature and odd humor made him a good fit. His boss came into his office and sat down one day while he was on the phone, and when Glenn stopped, he said, “Go ahead, I just like to hear you talk.” Glenn edited the Ramsey, Scarlett office newspaper, which, of course, he called “The Scarlett Letter”. Once, he put joke poems on every desk, including his own, except for one other person’s, and it was weeks before he told anyone the other guy hadn’t done it. Another time, a passenger died on one of the ships, and they weren’t able to locate the next of kin. They kept the ashes in a filing cabinet in the back office, and sent new people back there to look for something. When they worked on the top floor of the Kaiser Building, they had contests to see who could land a paper airplane on the next building’s roof. At the end of the day, they’d all pack into the elevator and punch every button so the doors would open with no room for the people waiting, all the way down. Todd seems to have had a pretty typical Suburban Sixties childhood, with trips back to his parents’ smalltown homes. When he was still small, Glenn and Anne used to put the Baltimore phone book on his chair so he could reach the dinner table. Once, on a trip back to Pennsylvania, they asked to borrow the phone book, not saying why they needed it, then laughed in surprise when they saw it was a quarter-inch thick. At some point, they got a dog and a cat. Todd would walk around the house with the perfectly-content cat hanging around his neck, the feet slung over one shoulder and the head over the other. He’d set up his race car track in the living room, and the cat would come running. It would perch on top of a tunnel and peer at the car sitting inside. Todd would press the trigger to start the car, and the cat would try to bat it off the track. Glenn said they’d play that way for hours. The dog became protective of Todd, and Glenn and Anne both noticed they had to spank the dog, too, when they spanked Todd. Todd would run and jump on the bed and cry afterward, and the dog would run and hide under the bed. When he got to school age, Todd played baseball, and once accidentally hit another boy with the ball. He felt so guilty that he went home and again buried his face in the pillows. When Glenn took him out to get his first bike, they stopped at Friendship Airport on the way home. Glenn took him to one of the empty parking lots and taught him to ride. When they pulled up at the house, Glenn took the bike out of the car and handed it to Todd, and Todd pedaled away, leaving the neighbors amazed at how he’d picked it right up. Glenn dug holes in the backyard to make a pitch-n-putt golf course for Todd and the neighborhood kids. When he came home from work, the kids would be sitting on his back steps waiting to play. Their parents would come over to putt or to play croquet, watching for opportunities to drive someone’s ball down the neighbors’ hill. When he got older, Todd started having parties of his own. Glenn came home one night when Todd was in high school and saw someone standing at the side of the house. He went to see what was going on, and found the classmate in charge of handing the beer through the basement window. Glenn marched downstairs to send everyone home. Todd and his friends once pooled all their money and managed to buy a hearse. They’d take turns parking it in front of their houses. Anne shouted, “You get that thing away from my house!” while Todd just laughed and laughed. When Todd started out on his own, Glenn got him a job offer with Ramsey, Scarlett, but they didn’t offer as much money as Todd was hoping to get. I believe Glenn said he went into the Merchant Marines for a time, then became a long-haul truck driver. He once took Glenn along on one of his trips. Glenn’s mother had suffered a stroke in her later years and died at age 70 in 1958. His father continued living in Bellefonte, then went to the same Methodist retirement home in Lewisburg where Glenn’s sister Kapey later lived. 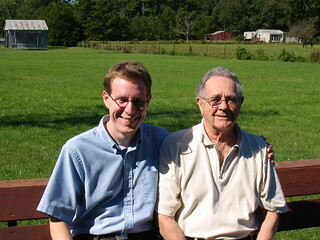 When Glenn and I visited Kapey there, it had grown into a large complex, but we sat a spell on the porch of the house which had been the only building in his father’s day. Glenn said there was only one television in the home then, and the rule was that whoever turned it on got to pick the program. His father would hurry through dinner to get to the living room and turn on the baseball game, then listen to the old ladies wander in and curse at him. He died at 92 in 1974. Anne gradually became crippled with rheumatoid arthritis, and Glenn cared for her from the time of his retirement from Ramsey, Scarlett in 1984 until her death in 1991. Glenn’s brother Jim had moved to a home near Annapolis, so Glenn got to spend time with him and his family over the years. A decorated Navy veteran, Jim was buried at Arlington after his death in 1999. Todd became estranged from his parents at some point, but he reconnected with Glenn after he and his girlfriend settled in Aberdeen. They talked on the phone frequently, and Glenn was struck by how Todd ended each call with “I love you, Dad.” Todd was diabetic, and Glenn was asked to make the painful decision to withdraw care from him when he was hospitalized in 2000 and had little chance to survive. Todd died at 45. Glenn used to lie in bed in the morning and think about Todd and how he felt Todd didn’t get enough out of life. Glenn got the call saying his sister Kapey had died in March of 2003. I was glad we’d made our trip the year before and had the chance to see her. Glenn was helped through these years of loss by the support of a new group of friends from his church. Glenn and Anne had joined Linthicum Heights United Methodist Church when they’d moved to Glen Burnie in the 1960s, and had been active members ever since. I found 63 installments of a series of articles called “Interesting Churches” Glenn had written for the church bulletin throughout the 70s, along with the stack of research material people had given him about churches around the world. When Anne became ill, Reverend Llewellyn (who later conducted both Anne and Glenn’s funeral services) asked for volunteers to stay with Anne while Glenn went to the local community college, where he took classes in Spanish, painting, and Phys. Ed. The people who offered to help weren’t sure what to make of Glenn at first (“What did he just say? Was that a joke?”), but soon grew to care for both Anne and Glenn, and formed long-lasting friendships with them and with each other. They eventually included Cindy and Bob Butz, Connie and J. T. Perry, Ruth and Jack Syme, and Millie and Dale Townsend, and they called themselves the “Kindred Spirits“. Before long, in addition to helping with Anne, they were doing things for each other and helping each other with various chores. Glenn once made pickles for them all to take home. Another time, he wanted to make dinner for everyone when they came over to paint the rooms in the house, but he’d barely mastered the microwave. (He’d always tell women to teach their husbands to cook so they wouldn’t be lost in the kitchen like he was.) He ordered a tableful of Chinese Takeout, and everyone had a great time sampling from the paper cartons. Everyone marveled that Anne, though she was clearly in pain, never once complained, and was always grateful for her new friends. So often in groups like this, the newly-single survivor of a couple is left out or drifts away once he’s on his own, but the Kindred Spirits were different, and Glenn had found devoted friends who would stick by him for the rest of his life. 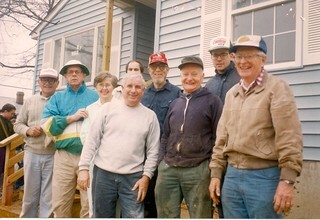 They saw each other in Sunday School (which Glenn eventually left when his constant topic-changing wasn’t entirely appreciated) and volunteered together to feed and house the homeless and work for Habitat for Humanity. Glenn always had a dinner invitation for holidays, and Ruth and Jack would have everyone to a condo in Ocean City in the Winter. They’d go camping together near Berkeley Springs, where Glenn would entertain everyone by cranking up the P.A. system and making bear noises just before dawn. They went to Fort Washington, where an historical re-enactor demonstrated firing a rifle and was startled when Glenn dropped face-first in the dirt. 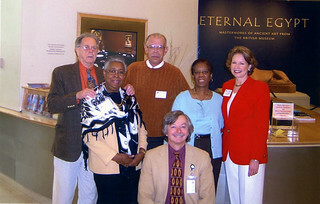 Ramsey, Scarlett added several sidelines to its shipping business, and one was a travel company. 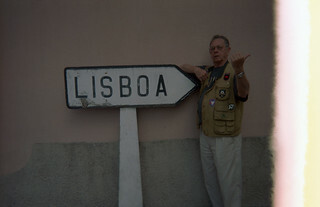 In the late 90s, Glenn used them to arrange trips to England, Spain, Morocco, and Turkey, paying calls in person to many of the ports he’d called on the phone over the years. He always said he was particularly “fascinated” with Turkey and its culture and history. He loved Istanbul and the ancient Greek and early Christian sites, and when the guide pointed out one of their massive water projects, Glenn shouted from the back of the bus, “Where is it? I don’t see the dam water!” He always wanted to have his picture taken having a cup of coffee on the Bosphorus, and finally did. When he came home, a small bottle of cumin became a fixture on his spice rack and seasoned our meals for years. When he wasn’t on the road, he was always on the run with volunteer work. It seems to have started with the Pasadena Theater Company. The PTC was such a small group that everyone in it did everything, and when Glenn wasn’t on the stage (and ever after singing “Camelot! Camelot!”), he was taking tickets or setting up the chairs in Baldwin Hall. He enlisted Mr. and Mrs. Yi and some of the Kindred Spirits to help, and they had a great time selling refreshments and watching the show. Glenn said that after you’re on stage with people, you’ve got friends for life. One of them, Joan Sullivan, told him that Centerstage in Baltimore needed volunteers. He started working as an usher there and at the Walters Art Gallery around the corner when a big touring exhibit would come through, handing out programs and telling people to come back if there were any big words, and he’d help them. He’d get two tickets from Centerstage for every two shows he’d usher, so friends and I enjoyed several seasons there, with Glenn giving us a preview of each show and telling us where to sit. 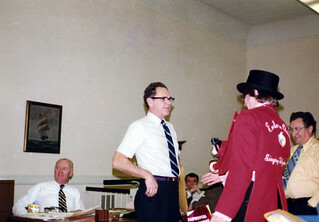 At the volunteers dinner at the end of the season, he’d get an auction ticket for each show he’d worked. He’d dump all his in the box for the tickets to the Totem Pole Theater, and would always win because no one else wanted to drive all the way to Thurmont. We’d head over for a Summer show and lunch at the Cozy Inn, and if it was a good day, Glenn would accuse me of being lost no more than three times on the way there. He volunteered at the observation deck on the 27th floor of the World Trade Center on Baltimore’s Inner Harbor, a few blocks from where the Ramsey, Scarlett offices had been. He got a kick out of it because so many of the people who came up there were Pennsylvania farmers like the ones he’d grown up with. They were used to seeing hills and fields every day, and were amazed by the sprawling city laid out at their feet. He’d point out the sites to them and let them know there were bungee cords available if they wanted to try them, but they had to be careful because one of the bungees was too long. Nearby Discovery Place opened a hot air balloon ride which would lift passengers almost level with the observation deck. He’d tell everyone that it only cost $1 to go up in the balloon — $11 to come back down. On the Fourth of July, he was able to take his friends up for the best view of the city’s fireworks display. One year, he stood and talked with a lady at a table representing one of the Maryland wineries, and was amused that whenever anyone came up to the table for a glass, she’d pour one for herself, too, and barely made it to the elevator at the end of the night. Baltimore Washington International Airport was an obvious place to offer his help since it was just a mile from the house, and Glenn manned the information desk there for years. I don’t know whether he derived more pleasure from meeting interesting people from all over the world or from being able to tell stories about the ones who would come up with questions like “What does ‘Departure’ mean?” and “When does the plane get in from California?” One of these must have cut his career short in the end. I don’t know what she did to set him off, but an English lady didn’t appreciate it when Glenn said “I’ll bet you people think we talk funny, too” as she was walking away, and a customer complaint led to Glenn turning in his badge. Glenn lent a hand when there was work to be done at his church, too. On some Sundays, he’d be asked to be an usher and pass around the collection plate. He’d hand it to someone, and when they’d hand it back, he’d look to see what they’d put in it, and hold it out to them again. I first saw Glenn standing on the corner of Charles and Eager, watching the 2001 Baltimore Gay Pride parade go by. I thought he had a kind face. He reminded me of a couple from Tucson who’d been great friends and a great comfort to me after losing Dan. I followed him when he walked into a bar. Since it was Pride weekend, the place was packed, and I went over to where he was standing against the wall and offered to buy him a drink. When a couple of places opened, we sat down and had a couple of beers. Glenn started to get a little tipsy, and while we were talking, he leaned over several times and whispered, “Don’t leave me”. I told him I wouldn’t, and I’m grateful that I never had to. I kept my home in Catonsville, but started spending the weekends with Glenn, then gradually spending almost all of my time with him. One morning in 2003, he rolled over in bed and went to put his arm around me, and it flopped around and hit me in the head. He got up to walk to the bathroom, and with each step, it was like he was stepping into a deep hole on his left side. I got him into the car and to the emergency room, where they found he’d a TIA, or “mini-stroke”. Because they intervened so quickly, the doctors we able to head off the worst long-term effects of the attack, and Glenn actually seemed to enjoy the next week’s hospitalization. He had me bring him boxes of chocolates to hand out to the nurses, and he was delighted when he’d tell them one of his terrible jokes (“What did the fish say when it swam up to a concrete wall? ‘Dam! '”), and it would go all around the floor and be repeated back to him by the next shift. Glenn was eventually able to start driving again and to return to all his volunteer duties. 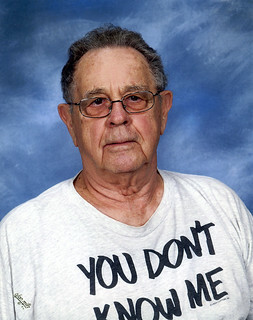 He added a current affairs class at the senior center to his week. It worked out well because the moderator took a positive view of Glenn’s quirks, laughing uproariously and slapping his knee whenever Glenn raised his hand and offered a random non-sequitor. We had five more wonderful years with Glenn on-the-go and in excellent health. His left side would weaken at times, and he went through a couple of rounds of physical therapy to put him back in motion. The loss of strength in his left leg finally caught up with him (“My foot feels like a big brick,” he’d always say), and he started having falls. He progressed from a walking stick to a single-point cane to a four-point cane to a rolling walker. His natural joy and optimism carried him through it all like it was another adventure, and he was absolutely delighted with his walker. He showed off its features to everyone he met, and equipped it with American and Canadian flags, maps of several states (to find the best route to where he was walking), a small piece of rope (in case he needed to tow someone), and caution tape (no idea why, possibly in case he got in a fender bender). We talked about adding headlights and a horn. When he was no longer able to cover long distances, we got a wheelchair so I could push him. When we went to Miami in June of 2008, we couldn’t take both the chair and the walker on the plane, so he spent the trip on his wheels. When he wanted to join the crowd in the pool, I pushed him to the steps leading into it, and we started discussing the safest way to get him in. An ingenious fellow came over with two friends and a plastic chair. Glenn stood and held the railing while we exchanged the chairs, then when he sat back down, each of us hoisted a leg, and Glenn rode into the water like a Pharaoh on a barge. We did a home exchange with someone in Toronto in August, so he was in the chair again for sightseeing. The result of all this sitting was that he was too weak to stay home by himself and had to come with me when I went to my parents’ 60th wedding anniversary in September. Our Summer travels over, I was going to get Glenn exercising and back on his feet for his Fall commitments, but he started getting sick almost as soon as we got home. I lost track of how many 2:00 AM trips we made to the emergency room before he was admitted with an infection which developed into a four-month stay in the hospital, in rehab, back in the hospital, and in rehab again. Glenn had shown slight memory problems for some time, but I hadn’t realized where they were pointing, nor how soon we’d get there. His last two rounds of physical therapy had been complicated when his tendency to doubt what other people said and assume he knew better (to be fair, he was often right) was compounded by his diminishing ability to concentrate and to remember advice and instructions. His last sessions in particular had been a challenge for a remarkable therapist who remained committed to Glenn even when he was less interested in working than in repeating the same jokes to the patient on the next table (“Are you artistic? I draw. I draw flies.”), or when he wouldn’t believe we wouldn’t let him get hurt when he practiced getting up after a fall, and just kept changing the subject until he grew so weak that we had to pick him up. The staff had all liked and cared for him, but there was only so much they could do when he couldn’t fully engage with the work. In rehab, the situation became worse with the full onset of dementia. While Glenn never had any confusion about who he was or about his history, his short-term memory became unreliable and would continue to worsen for the rest of his life. For his recovery, this meant that while he exercised and grew strong and there was no physical reason he couldn’t return to walking with the walker, he was just too scared to do it, and his fear kept him from ever getting back on his feet. The rehab staff brought him as far along as he could go, then helped me get the necessary equipment and make the necessary modifications to the house, and trained me in everything I needed to know to take care of him. At long last, he was getting a good night’s sleep in his own home. With visits from home care nurses and therapists, Glenn flourished, and we were able to start managing on our own after he was fully discharged. We got along fine for several months. 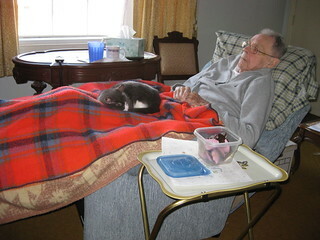 At the end of the Summer (2009), several crises in my family resulted in my parents moving into assisted living. Glenn and I moved into their home in West Virginia just before Christmas to look after it, and later to start sorting through their belongings after we decided we’d have to sell it. It wasn’t long before we were snowed in, and Glenn spent the Winter sitting in one recliner watching the Olympics while I sat in another beside him going through box after box after box. Glenn had a few episodes of fear of his unfamiliar surroundings, but mostly enjoyed the change, especially when the weather broke and we could start going on picnics and drives in the country. Above all, he enjoyed spending time with my family, since he loved people more than anything else. I only expected we’d be there for a couple of months, but we ended up staying ten. While Glenn mostly had a good time, it was a relief for him to be back home where everything was familiar and where he could be with friends he could remember. His checkup found him in good health, and he was pleased with Dr. Forman’s prescription of “unlimited ice cream” to keep his weight up. At Christmastime, Ruth and Jack threw a party at their home. Glenn was never able to remember where we were going or what we had planned, so he was surprised and delighted when he saw so many familiar faces rushing to greet him. He didn’t usually worry about his appearance, but this time he whispered to me to brush his hair, then he was off, making the rounds and laughing, happier than I’d seen him in ages. We settled in again and found projects to occupy us through another Winter, in between watching kids sled down Glendale and cars struggle to get up it. With the thaw, we were on the go again, seeing friends and taking advantage of all the city had to offer. In June, Glenn showed signs of what looked like the kind of mild cold he would get from time to time, but this time, it quickly worsened, and he went straight from the E.R. to the Intensive Care ward. I talked with his sister and friends almost daily during a month of small improvements, each followed by a sharper decline, and consulted with them when deciding to accept the doctors’ recommendation that the greatest kindness we could do him would be to let him go. Glenn’s been looking over my shoulder this whole time, saying, “What are you doing? Who’s going to want to read all this?” and probably dismayed that I took at face value all the bits and pieces he made up. But it’s a help to me and anyone who wants to jog a happy memory, and it’s a reminder of where to give my thanks when my jokes get sillier, my laugh grows lighter, and I wake each morning glad to see he’s still with me. What a beautiful tribute. Glenn was really blessed to have you with him for so many years. Thank you so much for sending my a copy. Wonderful to hear from you! I’m glad to hear you’re both well and happy together. Have a happy anniversary, and enjoy all your time with him.